3 in Floral Porcelain Basket Pink & White Flower Blossoms Figurine Delicate little Flower Basket with Pink and White Blossoms. Porcelain Floral Basket Pink & Yellow Rose Blossoms Miniature 3 in Delicate little Flower Basket with Pink and Yellow Rose Blossoms. Hot Springs Pottery Covered Casserole Dish Ark Arkansas Brown Green Beautiful Gloss Glaze of Brick Red, Brown, and Green Drip over Ivory Clay. Royal Haeger Pottery Earth Graphic Wrap Vase Olive Green Mid Century Mid Century American Art Pottery Vase in Rare Olive Color. Bear Pottery Green Drip Glaze 6 inch Vase Hand Thrown Oil Jar shape, Exterior Raised Horizontal Rings. White Clay, Dark Forest and Light Green Drip Glaze. Metlox Poppytrail 1972 Collector Plate Jingle Bells Songs of Christmas Lovely Christmas Plate from the Vernonware Songs of Christmas series. Antique White Pottery, Della Robbia pattern, Hand Painted One Horse Open Sleigh Scene, Green Trim. Titled: Jingle Bells, Second in Limited Edition Series, Made by Metlox Potteries. Gently Used. No chips, cracks, scratches. Original papers and box which has some wear. Sascha Brastoff Vintage Signed California Art Pottery Fabulous Abstract ashtray measures 10 1/2 inches x 7 3/4 inches. Background is white with gray air-brushed look. Houses are brown, brick red, & gold with black & trimmed with gold gilt. Signed Sascha B on Front. Back marked in gold with Rooster, Sascha Brastoff, California U.S.A.
Super condition, with only a little light crazing on underside & a very few extremely light scratches on 2 houses. 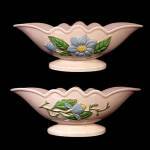 Beautiful addition to an American Art Pottery or Ashtray Collection! Royal Winton Grimwades Chintz Candy Cigarette Jewel Box June Festival Lovely rectangular porcelain china covered box with lid, decorated with blue & white flowers on maroon background. Nice vanity pin box size for storing make-up brushes or all sorts of tiny trinkets. A beautiful old Floral Chintz piece, Not a reproduction. Box measures 5 1/4 inches long x 3 1/2 inches wide x 2 inches high. No chips, cracks, or scratches. There is crazing that shows mainly on the white inside & bottom. Seven Falls Colorado Pottery Swirled Flower Frog & Bowl Vintage Beautiful American Art Pottery Planting or Floral Arrangement Centerpiece Bowl with Flower Frog. Blue Floral Bird Feeder Ceramic Sophia Laura Ashley Home Garden Decor Garden or patio decorative bird feeder made of cream colored ceramic, soft pastel lavender and blue floral design. University of IA Iowa Coin Piggy Bank Pig Pottery Souvenir Advertising Nice Piggy Bank done in Off White or Ivory, Trimmed with black tail, ear and facial features. Each side sports a University of Iowa Gold and Black Logo which says Organized February 25, 1847. Made in 1981 for C & J Specialities by the Hall China Company. Has a rubber stopper and felt padded feet. Gently Used. No chips, cracks, scratches. Paint and decals are nice. Looks like new, accept for the rubber stopper and felt pads which show some soil. Metlox PoppyTrail California Provincial Hen on a Nest. Chicken covered animal dish from the Vintage Poppytrail line. Great California American Art Pottery. Peters Reed Vase Scenic Chromal 1915 Arts Craft Pottery American Arts & Crafts Pottery, Circa 1915 matte glaze Chromal Vase with House or Castle setting on the mountain tops. Studio Art Pottery Multi-Color Gloss Drip Glaze Vase or Jar Hand Crafted Art Pottery Drip Glaze Oil Jar Style Cabinet Vase in Multiple Color. Ivory Clay, Gloss Drip Glaze of Green, Blue, Brown, Ivory, and Pink, squared, crimped rim, raised rings, Blue interior Gloss Glaze. Measures 7" H X 6 1/2" W.
Robinson Ransbottom Miniature Pitcher Mini Jug Hand Ptd Shadow Box size American Art Pottery Probably made by RRPC. Pale ivory pottery, unglazed bottom. The yellow gloss glazed pitcher is horizontal ribbed. One side has vibrant blue hand painted flowers, similar to tole ware painting. Colors are dark and chartreuse green, cornflower blue, white, and brown. Measures 2 5/8 inches high X 2 1/2 inches handle to spout. No chips, cracks, scratches, stains. Does have very fine crazing. Size: 2 5/8" H X 2 1/2" W handle to spout. Rookwood Pottery Peacock Bookends Arts Crafts Vintage Rookwood Pottery Peacock Bookends Arts Crafts Vintage. Yellow Matte Glaze Peacock at the Fence Pair of book ends by designer McDonald. These also make beautiful Paperweights. Measure 5 inches tall x 5 inches wide X 4 inches front to back. NO chips, cracks, crazing. A few tiny metal marks here and there. Super nice condition. Excellent addition to a American Art Pottery Collection. Start a family tradition with Quality Treasures the whole family will love! RS R S Germany Tri Handle Hand Painted China Toothpick Hand painted fine Bone China, pastel pink roses with touches of lavender and blues in the leaves. Three gold gilt handles and slight touches of gold on rim. Marked on bottom in green, RS Germany. Wade Gorilla Miniature Figurine Wild Animal Figure Mini Rose Tea Zoo Figural. Shadow box size. Made by Wade Pottery for Rose Tea Company as Premiums in the tea. Measures 1 1/4 inches tall X 1 1/8 X 3/4 inch. No damage. Does have glue and paper on bottom from being glued to a cardboard price tag. Vintage Mary Madonna Virgin Mother Wall Pocket Planter Catholic Religious Hanging Planter with Statue of Mary. Porcelain China, Brown wood grain under, gloss glaze, Hand Painted Statue in Pink and Blue, Semi-matte glaze. Made to set on table or has holes in back for wall hanging, has a shallow pocket underneath Mary. I think made by Enesco, Marked on bottom: E-1066 in green ink, under glaze. Probably made in Japan. Depth front to back: 3 1/4 inches. Gently Used. No chips or cracks. Has a few dark marks on base. Price is for one.ty Treasures the whole family will love. Illums Bolighus Miniature Boy and Sled Figurine Danish Modern Scandinavian Art Pottery Miniature Danish Modern Boy and Sled Figures. Red Brick Ceramic Clay, decorated with White Enameling, painted Black hair. Sled is marked with sticker tag: Illums Bolighus. Boy is unmarked. Age uncertain. Measures: 1 5/8" H boy, Sled is 1 5/8" L X 5/8" W.
Gently Displayed. No chips, cracks, scratches, crazing. Petit Rose Chintz China Teapot Pink Rosebuds 2 Cup Andrea Sadek Japan Small Teapot with delicate Flowers, just the right size for Tea for Two. Red Wing Reed 8.5 in Salad Plate Orange Vintage Pottery Made in the U.S.A. heavy Pottery Salad Plate in Vibrant Orange. Spode Red Transferware Bone China Bell Danbury Mint This collectible bell has a wonderfully detailed transfer design in Red on a Pure White Bone China background. The design surrounds the bell and consists of a Garden Scene, Buildings, People, Foliage and Flowers. Accented with 2 Gold Bands around Handle and just above the rim. White plastic Clapper. Marked: Spode, Fine Bone China, England and Designed and Produced Exclusively for The Danbury Mint. Measures 4 inches H X 2 1/4 inches W.
No chips, cracks, scratches, crazing or gold wear. Wedgwood Copper Lustre Pitcher Antique Jug Luster Ware Wedgwood Copper Lustre Pitcher Antique Jug Luster Ware. Covered with embossed, Copper Lustre decorated Grape Vines, Leaves, and Bunches of Grapes. Marked on bottom and Made by: Wedgwood of Etruria and Barlaston. Made in England. Also has some red letters and numbers: CM. 5870. T.
Measures 7.5 inches tall X 4.5 inches at widest bulge. NO chips. Does have a HAIRLINE crack about 1.5 inch long running downward from rim. It shows up from inside, but is hardly noticeable from outside. Copper is quite nice, with rubs on only a couple of the bunches of grapes. AS IS, but a beauty to add to your English Pitcher or Copper Lustre Collection. Ceramic Bottle Decanter Stopper Man Toby Ceramic Bottle Decanter Stopper Man. Cork fits about 1 1/8 inch opening. This looks like a brown pottery cold painted piece which was made in Japan. Maybe you have the decanter and need this stopper. Would look great with a Toby Mug collection. Great addition to a vintage Made in Japan collection. Chalkware Fancy Rooster & Hen Wall Plaques Pair Mid 20th Century Wall Decor, Handcrafted and Hand Painted, Black with Coppertone and Silvertone Feathers. They have loops and wires set into back for hanging. Measure approx 6 inches high X 8 1/2 inches wide. And 5 1/2 inches high X 9 inches wide. They have some tiny chips, nicks along the back side of edges. Each has a tiny nick approx 1/8 inch on front surface. I think they would touch up easily with a magic marker. Vintage German Lustre Childs Toy Candle Holder Germany Vintage German Lustre Childs Toy Candle Holder Germany. Vintage Porcelain China Set of Finger Hole Candle Holders. The lustreware paint is pale blue or lavender on one and the other is green. Each is decorated with a raised open pink rose in full bloom and a rosebud. These may be miniatures or part of a Children’s Set of Dishes or China. Incised mark on bottom: 5096 Germany. Measures approx. 3 inches diameter. NO chips, cracks. There is considerable lustre wear to the Green on top of candle cup and handle all else is nice. The Lavender is a tiny bit of wear to the rose petals, all else is nice. Cute addition to a Candle Holder Collection or Antique Child’s Set. Royal Haeger Art Pottery Planter Vase Bowl Pot Vintage Beautiful American Art Pottery Jardiniere with an interesting Sandy finish. Brown, Tan, Ivory Basket Weave, Sandstone Finish with Foamy bottom edge, Gloss Glazed Dark Brown rim, Interior and bottom. Marked on bottom: Royal Haeger U.S.A. Has with a thin, worn layer of satin like paper to protect furniture. Measures 5 1/4 inches H X 7 1/4 inches W.
No Chips, cracks, scratches. One flea sized nick on inside rim, and some very light crazing in bottom. Very light signs of use. Holt Howard Seahorse Sea Horse Tea Tile Trivet Castiron Cast Iron Vintage Mid 20th Century Porcelain Tile with white Stylized Sea Horse. into Cast Iron Trivet with 4 rubber capped feet. Marked on back Cherry, Made in Japan, 5B, 09, Holt Howard, 5176. Measures 9 1/2" H X 5 3/4" W.
corner. Tiny bit of light rust. (see Photos). Miniature Limoges Plate in Stand France Shadow Box Mini Royal Blue rim with hand painted courting scene. Red Wing Pink Grey Centerpiece Flower Console Bowl 134B Mid Century 1950s American Art Pottery Oblong Planting or Centerpiece Bowl. Coral Pink Interior, gently Stylized edging. Marked on bottom Red Wing, USA, 1348. Measures 12" L X 7 3/8" W X 2" H.
Four lilies grace this elegant sugar bowl. White Lily with green leaves on background shades of cream - tan - browns on White China. NO chips - cracks - stains - crazing. A few very light tiny usage scratches. Light gold wear around rim and a tiny bit on lid handle. Measures 3 3/8 inches high to top of lid handle X 4 1/2 inches diameter at widest OR 5 7/8 inches handle tip to handle tip. RS Germany Green Mark on bottom. Delightful addition to a RS Prussia type porcelain dinnerware collection! Old Sleepy Eye White & Cobalt 8 inch Blue Rim Pitcher Old Sleepy Eye White & Cobalt 8 inch Blue Rim Pitcher. Frankoma Coffee Mug Cup Amish Man Woman Kalona Iowa IA American Art Pottery Souvenir with Raised Silhouette Of Amish Couple on front, Kalona Iowa on Reverse side. Bottom is incised: Frankoma C5. Gloss White Glaze over a red clay. Measures 3 3/4" H X 3" W at rim. No chips or cracks. Light metal rub marks. Nice State of Iowa, Amish or Mennonite Collectible. Porcelain China Pin Cushion Broom Half Doll Vintage Victorian Half Lady to top a Pin Cushion or small Whisk Broom. Antique Copper Lustre 5in China Creamer Pitcher Jug Pottery Antique Cream Pitcher with Blue Fern Band around neck. 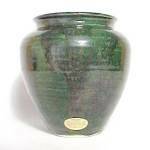 Dryden Pottery Tear Drop Relish Green / Brown 11 inch Gorgeous Green / Brown Drip Gloss Glaze over Ivory Clay Pottery. Beautiful Example of American Art Pottery. This relish dish is 11 inches L X 2 1/8 inches H X 4 1/2 inches W.
Gently Used. Absolutely beautiful. No chips, cracks, crazing. Has 2 super light 1/16 inch scratches on underside. Bottom is hand incised: Dryden. Aqua Blue California Art Pottery Ashtray Vintage USA Silver Flecked Robin Egg Blue Semi Matte Glaze. Lovely addition to a Mid 20th Century 1940s 1950s Retro aqua decor. White pottery, 3 Feet, 3 Cigarette Slots. Incised on Back: Made in U.S.A. No. L 502 110. Measures 9 inches diameter X 1 5/8 high at rim. Super nice condition. No chips, cracks, or stains. Underside has a minor light metal marks. Scottie Scotty Dog Scottish Terrior Chalkware Plaque Vintage Mid Century 1940s 1950s Hand Crafted Chalk Ware Wall Hanging. Three Dog Heads centered on oval Buckled Belt, hung over a fence or stand. Chalkware, twisted wire hanger on back. Colored Brick Red Rust, Brown, Tan, and Light Gray. Used. One tiny chip on bottom edge (See Photos). Eggplant Vegetable Headvase Figural Planter Flower Pot Unique Vintage Veggie Head Vase made in Japan. Hand Painted Rose China Open Salt Dip Cellar Dish Japan Tiny white china cups with gold gilt rim, hand painted pink & yellow roses and rosebuds, and a side vent. May or may not be marked Made in Japan. We have several for sale. Each is painted slightly different. Measures 1 1/4 H X 2 inches W.
Gently used. No chips, cracks, scratches. Very light gold wear. Blue Transferware Stork Compote H&C Ironstone Porcelain White porcelain with a faint blue tint, the Victorian Blue Transferware scene depicts Storks in a pond scene, on top, underside and around pedestal base. Marked with a double circle with H&C, leaves below circle and a crown above it. Measures 5 5/8 inches H X 9 1/4 inches W.
Used. Has over-all crazing. There are a few very light small scratches on plate surface. Underside has a 1/4 inch area where glaze is chipped or nicked. Underside of base has four 1/8 to 1/4 inch chips and light hairlines. A very unique antique piece. Blue Jasperware Jasper Dip Cream Pitcher Creamer 4.5in Vibrant Blue Wedgwood style Creamer decorated with raised white Grecian style ladies under a Leaf Garland. Unglazed Blue Porcelain Jasperware, small Cream Pitcher or Jug with rope twisted handle. Interior is gloss glazed gray, incised #9032 on bottom. Excellent condition. No chips, cracks. Has 3 tiny bubble pops along the upper rim. A lovely addition to a Wedgwood or Jasperware Collection. A beautiful kitchen decorative! China Stork Toothpick Holder Bird Heron Crane Majolica Heavy white porcelain Figural, could also be a cigarette holder, a fun conversation piece. Rare Brown Transferware Antique Plate Victorian English Lovely aesthetic Hanley English Dinner Plate from the Victorian Era. with richly detailed scenes of Etruria, historic Sailboat Vessels and a Arched Bridge. Made by Whittaker & Co. Pottery, Hanley, Stoke-on-Trent England, Circa 1886 - 1892.
over-all discoloration and crazing, but is still beautiful. Monmouth or Zanesville Pottery Maroon Covered Jar Pottery Cookware Bean Pot or Kitchenware storage container. Ivory Clay, Maroon Gloss Glaze, Horizontal Ringed bottom and Lid, decal of Colonial Lady in Bonnet. Marked on bottom: USA, probably made by Monmouth or Zanesville. Measures 4 1/2" W X 3 3/8" H.
Gently Displayed. No signs of use, no damage. Hot Springs Ark Pottery Deer Fawn Vase Drip Glaze American Art Pottery Deer Fawn Vase Brown Turq Yellow Drip Glaze. Treasure Craft Chicken Tea Tile Plaque Heart Vintage Trivet Very light beige pottery Tile with woven design and open-work Heart in center. Made to hold hot dishes and pots OR hang on the wall as a decorative plaque, by the indented hole in back center. Marked on back: Treasure Craft, just above the heart. Measures 9 inches H X 10 inches W.
No chips, cracks, crazing or stains. Scratches, if any are minuscule. Vintage Chalkware Lamb Chalk Wall Hanging 1950s Decor Vintage Chalkware Lamb Chalk Wall Hanging 1950s Decor. Unmarked - but so very Cute! Circa 1940s - 1950s Children's Nursery Rhyme plaque. Measures 7 inches high X 7 inches wide X 1 3/8 inches thick. No chips - cracks. Hanger is good. Paint is nice with exception of some missing on the black hooves and a speck on one eye. One tiny spot on bow trim is nicked but does not show without very close inspection The paint could easily be touched up. The patina is ivory or creamy white with peachy pink mouth and bow trim. It has silvertone sparkles in the wool. A darling decorative accent piece for a baby or toddler's room. 1979 Frankoma Pottery GOP Political Party Elephant Mug Nice US Political Party or American Art Pottery Collectible. Majolica Camel Dish L&R Germany Salt Cellar Figurine Majolica Camel Dish L&R Germany Salt Cellar Figurine. This charming Camel is a very unique Majolica style Dish, possibly made to hold salt, nuts, or jelly. It has a very shallow dish of about the size of a butter pat dish. Colors are green and brown. He is a really cool fellow! Ink stamped on unglazed bottom: L & R Germany. Measures 3 1/2 inches high X 4 1/2 inches long X 2 5/8 inches diameter at widest. NO chips or cracks. It has glaze crazing, the most noticeable is in the dish. 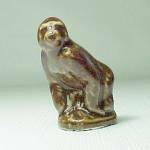 A great conversation piece or addition to a Majolica Pottery, Figurine, or Camel Collection. Vintage Brush-McCoy or McCoy Art Pottery Frog Planter This handsome fellow has a soft matte glaze finish. Niloak American Art Pottery Blue Ewer Pitcher Bud Vase American Art Pottery Pitcher Vase to accent your Décor or Collection. Ivory Clay, Vibrant Royal Blue Semi-Matte Glaze, Ewer shape. Incised mark on bottom is only partially visible. Measures 4" W X 7" H.
Lavender & Chartreuse Drip Glaze 5 1/2 in Pottery Vase Unique Art Deco shape, High Gloss Glaze exterior, semi matte interior. Measures 5 1/2 inches tall. No chips, cracks. A few minuscule rub scratches. Gorgeous coloring, nice addition to a collection. Old Sleepy Eye White & Cobalt Blue 6 inch #3 Pitcher Old Sleepy Eye White & Cobalt Blue 6 inch #3 Pitcher. These pitchers - creamers - sugars - salt boxes - vases - and other items were used as everyday utilitarian wares. 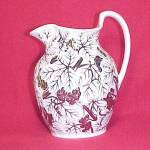 This very collectible #3 pitcher measures approx 6 1/2 inches tall to top of spout. It is really nice on the outside but does have some crazing and staining on the inside from age that could be bleached out. NO chips or cracks - one pin head sized nick to the very bottom edge. See photos.